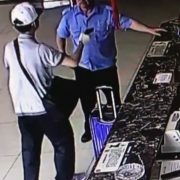 This security guard just wasn’t having it against this robber; I love it when a robber gets owned like this! Some good lessons for us to learn about clinch fighting too. The only news story I could find on this one is on MSN, but I would love to see it from a local source. https://get-asp.com/gwyh Unfortunately, my Chinese is bad. This CCW carrier had a big problem and a fairly narrow window to act, but he did well and ended the threat this robber posed! This is why thinking through your Active Self Protection is so important in advance, so you know when to act! 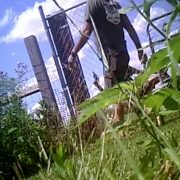 If you value what we do at ASP, would you consider becoming an ASP Patron Member to support the work it takes to make the narrated videos like this robber getting dropped by a CCW carrier? https://get-asp.com/patron gives the details and benefits. I FINALLY found a good news story on this one, and it says that three other robbers were arrested after the first one was dropped: https://get-asp.com/dzsd Turns out the gun he was using was a fake. We see armed robbers use fake guns pretty regularly when trying to rob a store, but in the moment of action there’s no way to tell whether the gun is a realistic-looking replica or real. Neither is a CCW holder responsible to know whether the gun is real, fake, empty, etc. If a robber is using a gun to threaten or intimidate, it is reasonable to use deadly force to stop that subjectively perceived deadly threat because there is objective evidence that the threat exists. If the threat turns out to be false later, that doesn’t negate the justification of the defense. Successful self-defense against many attacks involves a counter-ambush, where the victim finds the right opportunity to seize the initiative from the attacker and launch an ambush of their own. That involves thinking and knowing your own strengths and skill set, and being ready to strike the attacker when your opportunity for counter-ambush comes. It also means not allowing the attacker to see that attack until it’s launched. In the moment an armed robber attacks you, you must look for your opportunity to protect yourself. It is strongly possible that the moment of the attack is not that moment. You want to wait for the time that the armed robber is not focusing on you to act with decisiveness to protect yourself. Against multiple attackers every self-defender must know and train and practice that it’s death to focus on one too much. When every attacker is an equal threat, we practice the “Boarding House Rules” that everyone gets firsts before anyone gets seconds. If possible, stack the attackers one behind the other rather than getting between them, because if you get between them then one will have your back. It’s better if possible to work to the outside of the group and keep one between you and the others. When they’re not equal threats (like a gun man/grab man combination), the key is to be able to address the bigger threat until it’s no longer the bigger threat and then transition to whatever the biggest threat is. Marksmanship matters! The old saying is quite true: you can’t miss fast enough to win a gunfight. As a self-defender you need to practice and train to put your first shot on target as fast as you can, but the key is to put as many shots on target as possible. Usually the first person to put shots on target wins the gunfight. (not always, but usually) So putting the first shot on target every time and quickly is imperative. Armed robbery SHOULD be a hazardous profession, right? 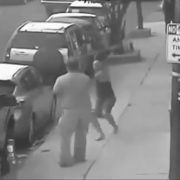 And this Good Samaritan gave him a significant beating, though there is a lot to learn here about the hazards of stepping into a deadly force encounter as well. If you value what we do at ASP, would you consider becoming an ASP Patron Member to support the work it takes to make the narrated videos like this Good Samaritan turning the tables on a robber? https://get-asp.com/patron gives the details and benefits. There are several news stories on this clerk and the robber: https://get-asp.com/pjh0 and https://get-asp.com/lra8 are the best I found. As each of us considers whether to be a Good Samaritan and step into encounters that do not directly involve us, we must consider the implications on our lives and families. Does your desire to step in override your duty to your spouse and children and loved ones? Or is it part of your care for your family to protect others wherever you can? Does the danger to yourself outweigh the benefit of stepping in? Having wisdom in these situations means thinking through when we would step in to stop a robber and when we should just get out of the danger zone. Emotional fitness is not only about staying in the fight, but about choosing to protect yourself wholeheartedly. Time and again we see victims “try out” defending themselves to see if they can, and then wilting when it doesn’t work immediately. This places them in grave danger from attackers who are now offended as well as aware that their victims could fight back. The lesson here is that if you’re going to comply, comply. But if you choose to protect yourself, in the moment you choose to launch your counter-attack, launch it with ferocity and commitment. Go “all in” and prevail 100%, beginning with spiritual, emotional, and mental fitness to win the fight no matter what. Anything else is setting you up for disaster. Perhaps the best thing this Good Samaritan had going for him is that he went with all he had! Rule number 1 of turning the tables on a robber: wait for your opportunity! 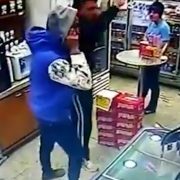 This robber I am sure regretted his life choices after this, and he will have a long time in the hospital to think about making changes! If you value what we do at ASP, would you consider becoming an ASP Patron Member to support the work it takes to make the narrated videos like this clerk turning the tables on a robber? https://get-asp.com/patron gives the details and benefits. There are several news stories on this clerk and the robber: https://get-asp.com/rlmm and https://get-asp.com/25fz are the best ones I found. If the attacker has a gun drawn on you, there is nothing you’re going to do in that moment to get your gun into the fight. It’s just not going to happen. You cannot draw from the drop! When someone has the drop on you, with a gun out and attention on you, it’s suicide to go for your gun. You have to earn your draw against the drop, and you earn that draw by either waiting for a moment of distraction for the armed robber (like if he looks away to check for people coming) or by closing the gap and using empty-handed skills to take his opportunity to use his gun away. If you don’t do either of those, you will likely be shot before your gun is in the fight. Situational awareness is useful for more than seeing the attack coming, but also for knowing what is happening during the attack. In particular, if your awareness is strong you might get to see an armed robber put their gun away to use both hands, or you might see that the robber’s gun malfunctions or is empty. That information can give you the cue to act definitively to defend yourself by running or by counter-attacking the armed robber. This is not only why awareness is important, but knowledge of firearms and tools is as well! Keep your firearm on your person! Plenty of people keep a firearm stationed near them under the counter or on a desk, but in the moment of need you can’t ever be sure that you can get to it if it’s not on your person. 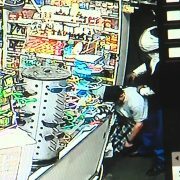 Here the only way the clerk got to it was because his partner distracted the robber. The bat wielding neighbor committed aggravated assault in this video, but the big dude handled him like a boss once the fight started! Lots of lessons here for our Active Self Protection. If you value what we do at ASP, would you consider becoming an ASP Patron Member to support the work it takes to make the narrated videos like this argument between neighbors that escalated to assault? https://get-asp.com/patron gives the details and benefits. Information on this one is sketchy, honestly, but I did find some good sourcing. What does this video teach us about defending ourselves against an armed attacker? If you can win “the fight before the fight,” you win. You win that fight by minimizing your potential for being attacked in the first place! That means making smart decisions and living a life of awareness and readiness so that you don’t take unnecessary risks. The Reddit thread says these guys had a longstanding beef, and that’s an indicator of problems to come. The eyes may be the windows to the soul, but the hands are the windows to the intent of a person. If you’re in a potential conflict, ALWAYS pay attention to what the aggressor is doing with their hands. They might have a force multiplier in their hand, or they might be hiding their hand so that you can’t see what is in it or using their hand to conceal something. If their hands are empty, there is a difference between someone with fists and someone whose hands are open and relaxed. As a self-defender your situational awareness must include seeing the hands of any potential threat in your vicinity, so watch the hands! Your mobile phone is a useful tool but a dangerous one. It can be used to communicate, to get emergency help to you, and to avoid problems altogether in numerous ways. It can also be a very dangerous distraction, because it is designed purposefully to grasp our undivided attention and hold it. When in public, use your mobile sparingly and correctly. Don’t allow it to hold your attention for more than 20-30 seconds at a time, and hold it high so that your head is up and you can see past it to what is going on around you. Use a single earbud if you are listening to music so that you can hear your surroundings as well. Yes, that’s a pain for those who are using their phone for entertainment, but in public you must consider your surroundings! Using your verbal judo to de-escalate and redirect a conflict is always the best choice if it is available, so make sure that your verbal game is strong. Knowing how to redirect, how to persuade, how to empathize, and how to talk someone down from a confrontation is critical to avoiding some fights. That said, we must also know that some people will not be dissuaded from a fight, so knowing when to talk and when to act is critical as well. These officers had to react SO fast to a very volatile situation. Heck, just clearing the house is a hard job! Good work assessing their options and protecting themselves. If you value what we do at ASP, would you consider becoming an ASP Patron Member to support the work it takes to make the narrated videos like these officers responding to the TASER failure? https://get-asp.com/patron gives the details and benefits. All officer related incidents get a lot of news coverage. https://get-asp.com/cixn and https://get-asp.com/3wxe and https://get-asp.com/gboc give all the details on this one. The original video is in the second link and shows that the man’s wife allowed officers into the house because of a DV call. What does this video teach us about defending ourselves when our tools fail? You must understand that your intermediate force options, those in between hands and firearm/knife (like pepper spray, TASER, baton, etc.) will not always be effective. They are designed to be used BEFORE a threat becomes a deadly threat, and we must always be ready for them to fail us. At that point, we must quickly decide whether the right answer is to move to empty-handed skills or to deadly force options. Whether you’re LEO or CCW, you need to know what force options you have available and when to abandon one and move to another. (“force options” are a better model than the older “force continuum” model) You need to know when your pepper spray is the best option, or when to abandon it (or the TASER) in favor of your firearm in a split-second decision. The best way, of course, to learn and embed these options in your mind is to train in force on force scenarios with the options and then respond to the situations appropriately. If you have a partner with you when you’re attacked (be it a LEO partner if you work on a team, or your spouse or martial artist buddy), you want to do everything you can to work as a team. Knowing each other well and communicating clearly will help you protect yourself from danger. This takes training and practice and commitment, but two partners working together present a formidable challenge to any attacker. The rules of firearm safety apply in a gunfight, just like they do on the range or in your home. Whether you prefer to articulate them as Colonel Cooper’s four rules or the NRA’s three rules (I have a discussion of my preference here: https://get-asp.com/cfgf if you want to read it), you must have the presence of mind to keep your firearm pointed in the appropriate direction and only fire when you will not hit an innocent. You are morally and legally responsible for the rounds that leave your gun, so make sure to train and practice so that you take responsible shots in the moment of need. One of the significant dangers in using your defensive firearm is to your support hand. This is usually only in play in a very close-range defensive shooting, say 6 feet or less. What we see happen on video regularly is that if a threat closes within about 2 arms lengths rapidly, the natural tendency is to release the support hand from the pistol and use it as a barrier to the attacker getting too close. The danger there is in floating the support hand out in front of the muzzle and shooting yourself! In training, that means we must drill and drill and drill the thumb pectoral index which minimizes the risk to the support hand, as well as drilling keeping the support hand close to ward off blows while using the firearm in defense. Against a mugger or armed robber, you MUST wait for your opportunity to get ahead of them and protect yourself. This firearms instructor did just that, and teaches us all a lesson in the process. If you value what we do at ASP, would you consider becoming an ASP Patron Member to support the work it takes to make the narrated videos like this firearm instructor launching a counter ambush? https://get-asp.com/patron gives the details and benefits. News stories on this firearm instructor need Google Translate from Spanish, but there are a couple of them https://get-asp.com/9py0 and https://get-asp.com/joe7 in order from earliest report to later. Note that the video evidence was significant in exonerating him. 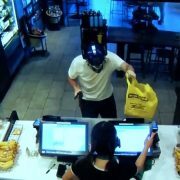 What does this video teach us about defending ourselves against an armed robber? Never leave your life-saving tools at home. Having attitude and skills to protect yourself with your firearm will not help you if you do not have it on your person when you need it. Leaving your gun in the glove compartment, on the night stand, or in your safe could be a fatal mistake. Keep your tools on your person whenever you legally can so that if (God forbid) you need them, you have them. This is the same reason you wear your seatbelt every trip in the car, and keep a fire extinguisher in the kitchen. You need to have it ready before you need it. Your firearm will only come out when it’s the worst day of your life, so make sure that you can draw that firearm quickly and reliably. Vet your carry position so that you know without a doubt that you can get a full firing grip and get the gun out of the holster and into the fight without fail. If you have to fumble to get the correct grip on the gun, change your carry setup until you can. Then train and practice until you can’t get it wrong. As the old saying goes, in a gunfight you have the rest of your life to get your gun in the fight, so get good at it. Feigning compliance can be an excellent strategy in an armed robbery to buy you time to find your opportunity to defend yourself. The hands-up, palms-out posture tells the armed robbers that you’re compliant, and might give you the opportunity to defend yourself when they stop focusing on you. It is critical to know not only how to shoot from the “press out” position, but also from high compressed ready and from retention. Being able to shoot from a high compressed ready as well as from retention are vital skills for all self-defenders to have, because drawing the firearm and using it when there is a threat within arms-length means not pressing it out to use it effectively. You must have the ability to use it in close quarters without endangering your firearm. This long simmering feud finally erupted into shots fired and a gunfight that teaches self-defenders a lot of lessons for before, during, and after a deadly force encounter. If you value what we do at ASP, would you consider becoming an ASP Patron Member to support the work it takes to make the narrated videos like this gunfight from a feud? https://get-asp.com/patron gives the details and benefits. News stories are extensive on this incident. A good overview of the argument history is at https://get-asp.com/3505 and https://get-asp.com/hxer gives some more. There’s more detail on their feud at https://get-asp.com/zj5j as well. What does this video teach us about defending ourselves in a gunfight? The first pillar of lawful, moral self-defense is “innocence.” (get a nutshell here: http://get-asp.com/wbbp or the whole concept here: http://get-asp.com/1fqe ) Innocence requires that we not be the instigator of the fight and that we not be the aggressor or the perpetrator. In some states when we attempt to leave or run we can re-establish innocence in self-defense, but states differ on that. Regardless, getting into a fight is a poor basis for a self-defense claim later, so always live in such a way that innocence isn’t a problem for you. Our defensive strategy is always dictated by our mission. It’s worth remembering that the mission of military members (to overwhelm the enemy with force and drive them from the battlefield) is different than the mission of law enforcement officers (to protect and serve the public interest by subduing and arresting those suspected of crime) is different than the mission of armed private citizens (to protect their loved ones from harm by breaking contact effectively with violent criminals). Those varied missions will dictate what skills are needed and what tactics are employed! In a deadly force encounter, decisions of life and death will be made in the blink of an eye. On the range and in class we have time to consider and to think and to reset and to make multiple attempts, but when the balloon goes up in real life you’ve got fractions of seconds to decide what the best course of action is to protect yourself. The way to be better at decision making in the heat of the moment is training, specifically scenario training and force-on-force training that is designed to work on decision-making skills under stress. It’s offered all over the country, so get training! 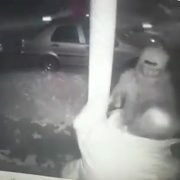 The defender in this incident found the right time to turn the tables on this mugger, and because he had his firearm on him and ready, the mugger took the Room Temperature Challenge. If you value what we do at ASP, would you consider becoming an ASP Patron Member to support the work it takes to make the narrated videos like this off duty officer avoiding the Room Temperature Challenge? https://get-asp.com/patron gives the details and benefits. News stories are scant on this incident. Best info I could find was https://get-asp.com/xgkv in the comments and https://get-asp.com/24vi for location data. If you have more, please send it to me at john at activeselfprotection.com and I will add it. 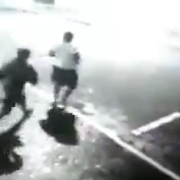 What does this video teach us about beating a mugger and protecting ourselves? The “master key” to situational awareness, as taught to me by my teacher Lawrence Robinson and his teacher Skip Hancock, is simple curiosity. You don’t have to be paranoid! Instead, simply be curious of your world like a small child is curious of their world. Look around you and really SEE. Look for what makes sense in your surroundings, but most importantly look for what’s out of place and doesn’t belong. I like to think back to the Sesame Street song “Three of These Things” and remember to look for the thing that doesn’t belong. As self-defenders, you’re looking for someone who doesn’t belong in their environment. A person standing still while everyone else moves. A person in a hoodie with the hood up when everyone else is in shorts and flip flops on a hot day. A person loitering where people come and go quickly. If you are curious and looking for what doesn’t belong, you’re 99% of the way there to being aware of your surroundings! Emotional fitness is not only about staying in the fight, but about choosing to protect yourself wholeheartedly. Time and again we see victims “try out” defending themselves to see if they can, and then wilting when it doesn’t work immediately. This places them in grave danger from attackers who are now offended as well as aware that their victims could fight back. The lesson here is that if you’re going to comply, comply. But if you choose to protect yourself, in the moment you choose to launch your counter-attack, launch it with ferocity and commitment. Go “all in” and prevail 100%, beginning with spiritual, emotional, and mental fitness to win the fight no matter what. Anything else is setting you up for disaster. Keep your firearm ready to fire. Some people carry their firearm with an empty chamber, but doing so is not recommended for several reasons. First, it assumes that you will have both hands available to you to draw your firearm, which isn’t necessarily the case. You might have a hand engaged or injured. Secondly, it assumes that you’ll have time to chamber a round in a gunfight, but gunfights are won and lost on tenths of seconds. Third, it assumes that you’ll have the dexterity to chamber a round under duress, though in the moment many times I have seen people fumble their chambering attempt. Fourth, the sound of a round chambering can alert an attacker who is not focused on you that you are a danger to him, which can negate your element of surprise in a counter-ambush. Keep your defensive firearm ready to fire, with a round in the chamber! This shootout between Dundalk, Maryland officers and a known armed robber is one of the craziest that I have ever seen. SO much to learn here that it’s the longest video I have ever narrated! If you value what we do at ASP, would you consider becoming an ASP Patron Member to support the work it takes to make the narrated videos like this officer involved shootout? https://get-asp.com/patron gives the details and benefits. News stories on this shootout abound. What does this video teach us about the chaos that is a real shootout? The first and most foundational part of Active Self Protection’s defensive strategy of “Attitude, Skills, Plan” is Attitude. You must cultivate the attitude that you are responsible for your own self-protection and you are the primary agent in your own rescue. You and only you can choose to cultivate an attitude that no one has the right to harm you or your loved ones and you have a right and a responsibility to stop anyone who threatens to harm you and yours. The first officer went looking for an armed robber but didn’t appear to be mentally and emotionally ready for the trouble she was walking into. If you know trouble is likely, whether a shootout or something else, get emotionally prepared! Marksmanship in a real deadly force encounter might mean that you need to be ready to make a precision shot on a threat, and you must be prepared emotionally and skill-wise to do so. Shooting a threat in the face, a target the size of a 3×5 card, under stress is no small feat! To be able to stop a terrorist attack or hostage situation, though, it is a necessary skill and you should train and practice your marksmanship until it is second nature. A good standard is Dave Spaulding’s “Skill on Demand” drill, which involves 2 shots in 2 seconds at 20 feet, in a 3×5 card. Always remember that while good people practice firearms safety at all times, criminals do not. If they cared about firearms safety, they wouldn’t use firearms to hurt people! They will endanger a bystander or a crowd to get what they want. They will take reckless shots. They will flag everyone in the place to threaten them with harm. They will negligently discharge their firearm. That is a prime reason that we need to smartly end the threat, because as long as the attacker has a firearm out, everyone is in danger.